Sarah Washington is an artist and activist working in the fields of experimental music, radio art and social justice. Formerly a director of the London Musicians' Collective, she helped to create the radio station Resonance 104.4FM and the global radio art network Radia. For live performance she uses self-built electronic instruments, ultrasound devices and radio transmitters. 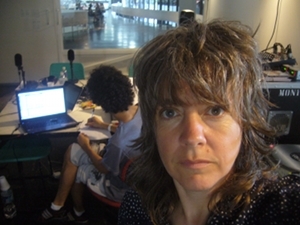 In 2005 she began the project Mobile Radio with Knut Aufermann to work internationally in the production of temporary radio stations, unique broadcasts, radio installations and workshops for cultural institutions and media festivals. The pair also have a performance duo called Tonic Train, and collaborate extensively with musicians and other artists. In 2007 the Tate Modern in London commissioned her to produce a radio art series which was titled Hearing in Tongues, and in 2012 Mobile Radio exhibited the radio station Mobile Radio BSP at the 30th Bienal of São Paulo. 06. 11. 2016: "Radio Revolten Brücke"
03. 12. 2017: "Nicht nur im Kopf"
07. 01. 2018: "One Thought Fills Immensity"